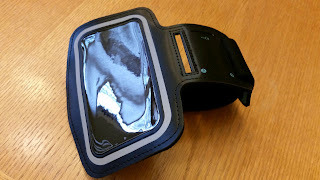 I've been wanting to try one of these armbands for a while now, so when I got the chance to receive one for review, I jumped at it. I walk every morning, and my phone can and will keep track of my steps. However, it's a bit awkward having to carry my phone the whole time or trying to put it into my pocket. It's just a bit too big. Enter this handy armband! The phone fits snugly and securely into the armband. The neoprene folds right over the top so there's no chance the phone can come out. I'll admit that I didn't notice that the first time I used this, and I strapped the armband on upside down, which could have been disastrous. But, it held tight and my phone was fine. Now I know to tuck it all the way in, and it's definitely safe. The only thing I really don't like about it is that I have to take the case off the phone for it to fit into the armband. I realize there are many types and sizes of phone cases, so there's no way they could design the armband to handle all the cases. That really is a minor thing, though. I like that the touchscreen of the phone is still usable through the armband cover. The armband straps onto my arm so I can take my walk without worrying about the phone again. It is taking me a bit to get it strapped onto my arm, but I will get it with time. It's just a bit awkward trying to get it on using one hand, but that's probably just me. It's really comfortable once I get it on, and I'm just enjoying being able to take my phone with me when I go for my daily walks. Now I'm wondering how my phone will work for audiobooks. Maybe I can start leaving my mp3 player home and just take my phone? COMPATIBILITY: Compatible with the Samsung S5 S4 S3,iPhone 6 (4.7) and HTC One phones from all carriers - AT&T, Sprint, T-Mobile, Verizon etc. SIZE: Fits sizes from 9 to 14.5 inches. Not for body builders or those with biceps over 14.5 inches. Disclosure: I received a free armband for the purposes of review. All opinions are mine.